Daily life in ancient Ostia. 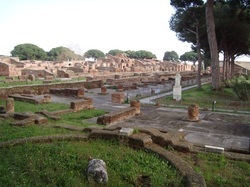 The ruins of Ostia provides a fascinating insight into daily urban life in Roman times. Ostia was the port of ancient Rome and a city in its own right. At the peak of Rome’s power the city had 50,000 inhabitants and was improved in its facilities by several emperors. Its fate was tied closely to the one of the empire. The barbarian sieges of Rome in the 5th century spelled the end of Ostia. The city eventually withered when the Roman Empire and Rome itself were no longer there to trade with,and also because of the endemic malaria its ruins were buried by the sand that has so magically preserved it. As in Pompeii you have the feeling that the clock has been turned back of nearly 2,000 years. Visiting Ostia we’ll learn about the different aspects of the Roman life: the living quarters of both the upper and lower class, the theater and meeting places, Roman public toilette and baths, coffee shops and restaurants up to their burials habits, while we will be walking on the ancient cobblestones streets surrounded by vegetation and umbrella pines trees. A charming and instructive tour I warmly suggest you.